Talk about a powerhouse fruit, blood oranges are packed with the benefits of two SuperFoods. You probably skip over them at the grocery, but check out this blood oranges nutrition information first. What if you could take the polyphenol and vitamin C power of oranges and combine it with the potent anthocyanins that are found in berries? Well, you could get out the blender and make a smoothie, or you could just grab a blood orange. These oranges are a pigmented, Mediterranean variant that have a reddish-orange outer peel and red flesh. Typically, the oranges are red throughout, but many have red stippling, and some have an inconsistent coloring in their flesh and rind. The red color comes from anthocyanins which are not only pigments but also excellent antioxidants. Anthocyanins, a type of flavonoid phytonutrients, are the compounds in berries and red wine that make them SuperFoods. Anthocyanins work in the body to prevent oxidative stress from free radicals and help control inflammation. At the supermarket the other day, I saw a women pass up the blood oranges for some over-ripe tangerines. When I asked her why she didn’t get any blood oranges, she confessed that she had never had them and was worried about their taste. Well, let me tell you, as I told her, blood oranges taste great. They are sweeter than regular table oranges and have less bitterness and acidity as well. Furthermore, blood oranges are still high in vitamin C, potassium, dietary fiber, carotenoids, and polyphenols like their citrus cousins; and they have the added benefit of anthocyanins. You can use and eat blood oranges the way you do regular oranges. I find them easy to peel with minimal seeds. I like to peel them and put them in the food processor with some low-fat yogurt and a banana for an easy morning meal. They are in season right now, and I have noticed they are reasonably priced, probably because they aren’t yet as popular as regular oranges. 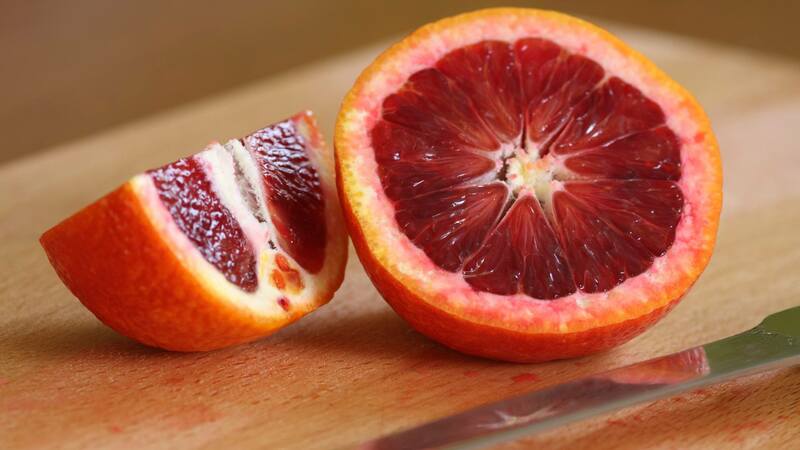 The kind of blood orange I find at my supermarket is the Moro type, which is the most prominent variety. So, go out and try some blood oranges — you’ll be happy you did. One small word of caution: The only problem I’ve had with blood oranges is that, like berries, they stain clothes. Be sure to have an extra napkin around when enjoying one of these delicious SuperFoods.